Just a little over an hour from the northern suburbs of NYC, in the northwest hills of Connecticut lies one of the best kept secrets in trail running around! 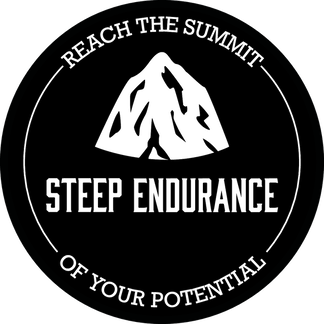 If you are ready for a challenge of some awesome trails, then the Steep Rock Trail Series brought to you by Steep Endurance is for you! In cooperation with the Steep Rock Association, the Steep Rock Trail Series gives runners a chance to experience the idyllic trails of the Steep Rock Preserves in Washington, CT. Each race offer its own sweeping viewpoints, lush forest single track trails and hillsides, babbling brooks and streams, old rail beds, rural landscapes, and of course the ever present New England fall foliage. With each subsequent race, runners will progress from a 10K up to a Half Marathon. T-shirts will be offered to the first 100 pre-registered runners in each race. 10K: The first race in the Steep Rock Trail Series, the Steep Rock 10K starts near the entrance to the preserve where runners will begin with about 2 miles of flat terrain on Tunnel Rd., before entering the Steep Rock Tunnel. After exiting the tunnel, runners continue straight until a couple of quick left turns to enter the southern end of the preserve. A long grinding climb up to the high point of the course at the top of the Pinney Loop Trail. A beautiful descent through the fern lined trail and then it’s back onto the rail trail. A couple of quick up and downs with the last one a gentle descent on Spring Hill Rd. After crossing the new Spring Hill Bridge, runners re-enter the trail to work their way up to the Holiday House on their left. A quick left down a somewhat technical descent and runners are in the home stretch along the river, through the parking lot and to the finish at the horse corral. This course is starts off easy in the first few miles, but is very challenging in the last ⅔ of the course with several climbs on the awesome, flowy and sometimes technical single track trails of the Steep Rock Preserve. 15K: The second race in the Steep Rock Trail Series, the Hidden Valley 15K, starts near the entrance to the preserve where runners will begin with a gentle single track climb in the first mile before reaching an overlook point around the 1.25 mile mark. A few short steep ups and downs along with gentle rolling trails for the next few miles as the course winds towards the northeastern section of the preserve. A quick trip onto the pavement of Sabbaday Lane and it’s another quick climb to the highest point on the course just past 5 miles. A 300’ downhill drop in the next mile provides a welcome relief to the runners as they descend back down towards the river. The next few miles are generally flat along the river with a little side trip through an old quartz mine. Just before mile 8, it’s across the river on a several tiered wooden bridge with steps leading to the opposite side. A quick short ⅜ mile climb with a few switchbacks and it’s all downhill to the finish for the last mile on sweet buttery single track. A quick trip across the Thoreau Bridge and runners arrive at the finish line! This is an extremely beautiful course, but requires strong discipline to start slow and finish strong! Half Marathon: The Steep Rock Half Marathon starts near the entrance to the preserve where runners will begin with some gentle single track through the northern end of the preserve along the river before making the steep climb up to Barnes Rd. From there it’s quick trip on the pavement to rejoin with the preserve trails at the end of Ferry Bridge Rd. As runners enjoy the early miles they will pass by the old foundation of the Holiday House as they work their way on gentle tree lined downhill trails towards Spring Hill Rd. After the short, but runnable climb up the dirt road, it’s a sharp right turn back onto the single track into a less traveled part of the preserve, weaving your way up then back down to the river a couple of times. After reaching the southern part of the preserve via a winding technical rocky descent, you will find yourself on the old Shepaug Railroad rail trail before entering the iconic Steep Rock Tunnel for the first time. It’s a beautiful site and you will feel the rush of cool air upon entering. Exiting the tunnel, it’s a couple of quick turns, up a steep hill, and down towards the beginning of the Clam Shell section of the preserve. This is mostly a flat trail along the river. On the left hand side, you will see a huge boulder in the middle of the river that fell from the cliff above many years ago. About ⅔ of the way around the Clam Shell, you will come upon the first river crossing of the day, a double crossing with a small island in between. Leaving the cold water of the Shepaug River, runners will make a quick climb up the single track, then a sharp right turn down one of the pine tree laden sections of trail on the course towards the Hauser Footbridge, but will again cross the river at another one of the “ford” sections of the river before then crossing over the bridge to return back to the north side of the river and turning right. Some flat sandy trail along the shore and it’s time to hit some technical, rocky portion of trail before starting the climb up towards the Steep Rock Summit. It’s about a 300’ climb, but over a distance of only 4/10 mile. Upon reaching the summit, take a look to your left at likely the best view in the preserve! Then it’s down the backside on some technical rolling (with just one short climb) downhill to the river. Another quick river crossing, a short climb up, and you have reached the Steep Rock Tunnel again. After passing through this time, it’s all rail trail and flat dirt road for the final 2 miles with just a little single track in the last ½ mile. A downhill finish awaits you back near the riding ring. This course is challenging, with a mix of lush and technical single track trails, rail trail, river crossings, but a relatively fast finish! All races start at 8:00 a.m. The 10K/15K races will not have a cutoff time, but the Half Marathon participants will be requested to start an hour early if their anticipated finish time is more than 3 1/2 hours. Will we have water and/or electrolyte drink at aid stations plus other typical food items (potato chips, pretzels, candy, etc.) for every event in the Steep Rock Trail Series. Keep in mind that Steep Endurance events are "cupless" races. Runners are required to carry their own hydration bottle, pack, or cup. This policy is put into effect in an effort to reduce the amount of waste and adopt a sustainable “green” practice for the race and the sport of trail running. These rules are meant to make your experience during any Steep Rock Trail Series event a positive one. Most of these are common sense type policies that you will see at any trail or ultra race. Absolutely No Littering! The vast majority of each course is on Steep Rock Association preserve land. Please respect that we are using their 3 amazing and beautiful trail systems for our races. Failure to do so could jeopardize the future of the series. Please respect others that are on the trail. Most of the trails on the course are open to the public and some are fairly well travelled (especially those in the main Steep Rock Preserve). Please announce your intentions to pass if you are coming upon a hiker or another runner. Smoking is not permitted on any of the trails or at any checkpoint by runners (probably shouldn’t be doing during a trail race anyway). Alcoholic beverages are also not permitted in any sections of the Steep Rock Preserves. The use of personal music devices is strongly discouraged at this race. To enjoy all that our race has to offer and for the safety of all participants, the Steep Rock Trail Series encourages a headphone-free environment during the running of the race. We believe your race experience and those around you will be greatly enhanced by leaving the headphones at home or in the car. Running headphone-free allows opportunities to develop camaraderie with your fellow runners and to enjoy everything the race has to offer. Plus, volunteers and spectators will be on course cheering you on and providing directions to help get you to the finish line. Runner safety will be a top priority for our events. SMILE and enjoy the race! You are lucky to be enjoying these beautiful trails! You’ve just finished a super challenging course! Enjoy your accomplishment, sit back, relax, and don’t forget to cheer on all the runners coming in behind you! We will have the usual spread including bagels, fresh fruit, pizza, non-alcoholic hydration options. **There is no alcohol permitted in any of the Steep Rock Association Preserves. The Fall season is a beautiful time of year in Connecticut with fall foliage at or almost at peak. Average high temperatures range from the 50’s to 60’s with low temperatures in the 30’s and 40’s. That’s pretty much perfect running weather! In the Spring of 1889, just as he was about to break ground on his own country house in Washington, Connecticut, the architect Ehrick Rossiter discovered that the wooded hillsides in his dramatic view to the west were slated for clear cutting. For him, there was only one thing to do. Using the construction money for the house, he bought the threatened land from the timber company and saved forever the 100 acres that now form the heart of the Steep Rock reservation. 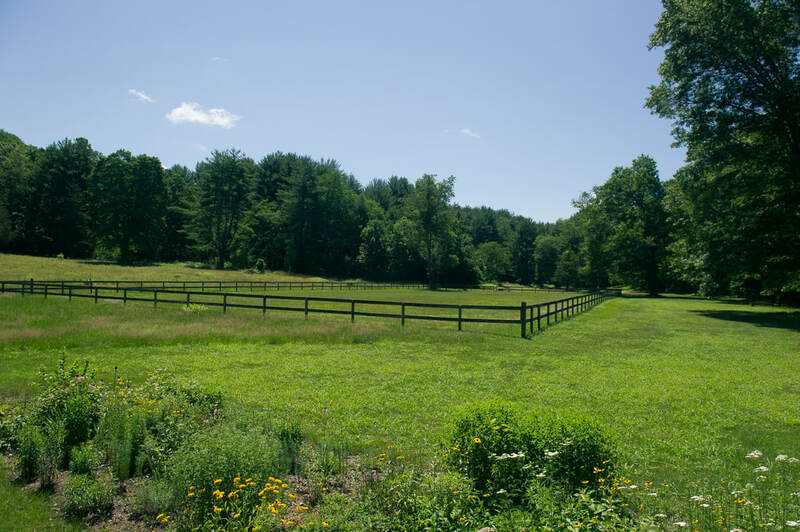 During his 36 years of ownership, Rossiter built carriage roads and small river crossings and invited his friends and fellow townspeople to enjoy the wild beauty of this section of the Shepaug River Valley. In 1925 Rossiter donated the land, which included the Steep Rock overlook, to a carefully chosen group of trustees, thus ensuring its preservation. Four years later the trustees purchased the area known as the Clam Shell, and in doing so preserved the view from Steep Rock. With little of the fanfare that sometimes surrounds such efforts today, these ten people quietly established a public land trust long before the idea of land protection became common. 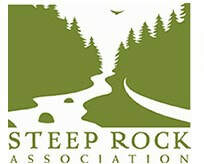 Since then, many landowners have given additional tracts to the Steep Rock Association, and today Steep Rock’s holdings include over 2,700 acres. The 974-acre Steep Rock preserve offers hiking trails which follow the river banks and provide access into the hillsides above. Near its north end, there are vestiges of carriage roads, one of which leads from Tunnel Road to the site of the Holiday House (no longer standing), a hotel built in 1893 by philanthropist Edward I. Van Ingen as a retreat for young working women from New York City. The project took advantage of the Shepaug Railroad which, from 1872 to 1948, wound through the preservation alongside the river. One can still see the abutments of the small suspension bridge which enabled disembarking passengers to meet the Holiday House carriages waiting on the opposite bank. Farther downstream, trails traverse the slopes above the river and follow the double oxbows (where the river loops south, north, and then south again). Nearby is the railroad tunnel, a rough arch cut through the rock ledge which allowed just enough room for the locomotive and cars to pass through. The section northeast of the Depot is known as Hidden Valley, a 650-acre tract characterized by densely wooded hillsides cascading into the meandering river below. This section also includes a rocky high point and small meadows, accessible by hiking trails. Hidden Valley was donated to the Steep Rock Association by the Van Sinderen family in 1963. The level trail lying alongside the eastern bank of the river replaces the defunct railroad bed. It is easy to forget that passenger and freight trains rumbled through the entire length of the reservations from 1872 to 1948. Trails and woods roads remaining from the Van Sinderens’ equestrian and carriage-driving days criss-cross this tract of hardwoods, pine groves, and hemlocks, although many trails are not marked. A footbridge built across the Shepaug River in 1985 makes possible many pleasant loop walks. Care must be taken to avoid the goshawk area north and west of the footbridge in the nesting season. From April through June warning signs are posted and trails are then closed.